Lone Tree, a giant, solitary cottonwood, was a noted Platte River landmark as early as 1833. Standing on the north side of the river some three miles southwest of present Central City, the tree was visible at great distance. Several travelers estimated they could see if twenty miles away. The tree was especially prominent since timber was rare on the Nebraska prairies except in stream valleys, where it received protection from prairie fires. The Mormon Trail passed by Lone Tree, as did the Omaha-Fort Kearny stage route. The tree also gave its name to a stage station and a town, later renamed Central City. Ten to twelve feet in circumference, the tree's total height was about fifty feet; its lowest branches were about twenty feet above the ground. Passing travelers often camped beneath Lone Tree and carved their initials on its trunk. This probably hastened its end, for the tree was dead by 1863. A severe storm in 186 5 brought it to the earth. In 1911 residents of Merrick County erected a stone in the shape of a tree trunk on the site once occupied by Lone Tree. 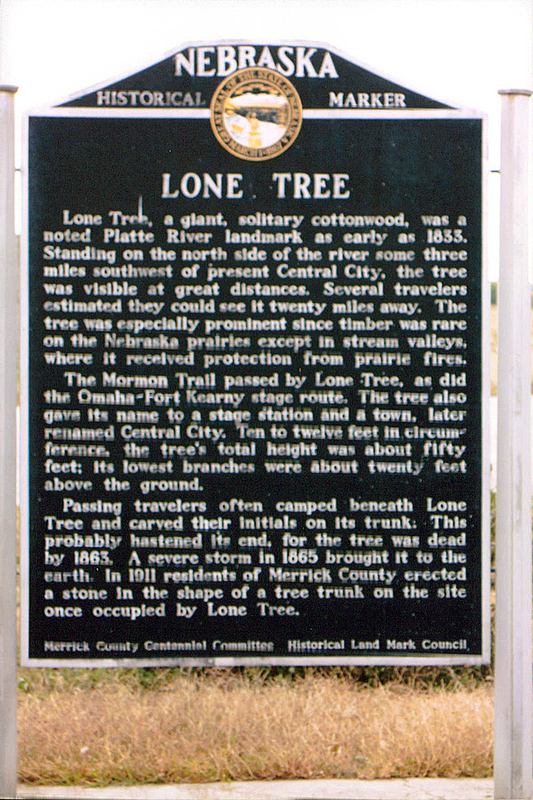 “Lone Tree,” Explore Nebraska History, accessed April 19, 2019, https://mynehistory.com/items/show/359.